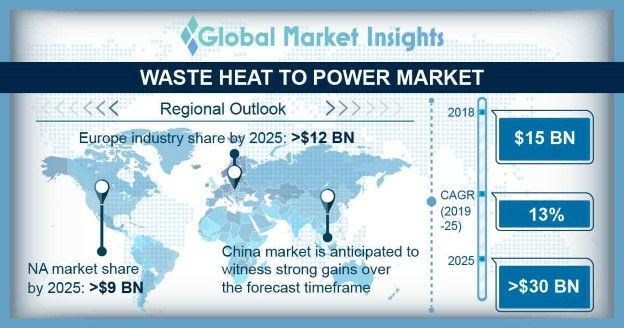 Waste Heat To Power Market size will surpass USD 30 Billion by 2025, as reported in the latest study by Global Market Insights, Inc.
Resurgent economic growth along with rapid industrialization across key nations will drive the global market growth. Supportive policies coupled with government spending toward infrastructure development will further provide an impetus to the expansion of Energy Intensive Industries (EIIs) which in turn will complement the industry landscape. Furthermore, rising focus to reduce the overall operational cost of industries will thrust the deployment of WHP units.